I love marketing automation, but some marketing automation vendors would have you believe that inbound marketing is the only approach that works anymore and that outbound marketing is no longer effective. People can tune out messaging they signed up for just as easily as they can tune out messaging they were not expecting. Conversely, they can also be intrigued by either. The key is to understand the strengths and weaknesses of both inbound and outbound marketing and create a blend that works best for your business. The basic idea of inbound marketing is that a lead has shown interest in what you offer and has even gone so far as to give you permission to contact them. Sounds great, right? Who wouldn’t want leads reaching out to them only when they are sincerely interested in their product or service? Who wouldn’t want leads that give a direct request to send them information? Let’s break this down a bit. If you really know your customer, it is easy to create campaigns that intrigue them and to incorporate keywords that you know they are searching for. Same thing with knowing where to find your customer; if you know they are on Facebook, that makes life a lot easier. Get blog updates sent right to your email! That last point – your customer is already looking for you – is especially important. After all, if your customer is not already looking for your company or your specific product/service, they are going to have a hard time being drawn into your inbound campaigns. If your company is brand new, it will be harder for people to find your inbound campaigns. If you offer a service that is different from they are used to – even if it is much more helpful – they might not stumble on you as easily as you’d like. Same thing when people only use your product or service infrequently, or if you have a long sales cycle. Now let’s look at outbound marketing – is it really so imposing and awful as recent hype might have you believe? Outbound marketing, which includes advertising and cold calls, is very useful when you need to get your product in front of people in a hurry. Inbound marketing takes time; outbound doesn’t. Outbound often requires money for advertising or list purchasing but it might only require some scrappy research. Like compiling a list of prospects using good ol’ Google. Outbound marketing can also be very useful when you have a very specific offer and you know exactly how to find your prospects – via snail mail, email or even a trade show. Of course, life is a mix of pros oand cons. With outbound marketing, the cons are the one-off nature of the approach. For long-term relationship building, outbound marketing is not so useful, nor is it especially helpful in qualifying leads based on nuances of lead score. Interestingly, you will see that a long sales cycle appears in the “not so great” lists for both inbound marketing and outbound. Long sales cycles mean the prospect is not urgently thinking of what you offer, which means they are less likely to be looking for information via an inbound campaign. However, it also means that – once you have their attention via an outbound campaign – you need a way not to lose it. So, what do you do? Which is better – inbound marketing or outbound marketing? 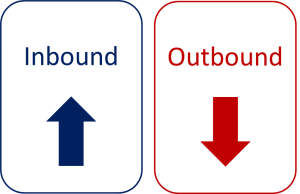 It’s a mistake to think only inbound or only outbound is the way to go. In most cases, your business will need a mix. Outbound marketing is great for filling in the gaps of your marketing plan, especially when you are in launch mode. Cold calls, cold emails, face-to-face selling at trade shows and even paid ads and native content can be a great way to kick-start your sales. Once you’ve established contact, then use inbound marketing to generate interest and do permission-based outreach. For instance, in the case of a long sales cycle, you might try cold calling a list and inviting them to sign up for a nurture program that provides educational content. So, ignore the hype. However you build your marketing program, a combination of inbound and outbound marketing techniques will put your company in the strongest position.